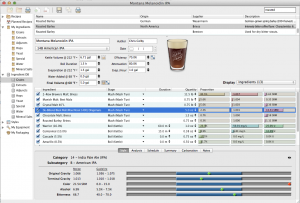 In a separate article, I described how to brew an IPA-based beer with just enough debittered black malt to turn it dark, but not enough to give the beer a prominent roasted malt flavor. (The roasted flavor could vary from undetectable to faint.) I called those beers black IPAs simply because that’s what a lot of people are calling them. Today I’m going to describe a similar IPA-like brew, this time with enough roasted grains to add a small amount of roasted malt flavor to the beer along with the color. For the sake of having a label, I’ll call them Cascadian dark ales. I’m not using the term to indicate that I think it’s a good name. (I don’t.) It’s just that making up a whole new name for the sake of the article is an even worse choice. What I’ll focus on is the fact that you can make a dark, lightly roasty beer with a lot of hops and have it turn out tasty. Also, if you want to, you can do a few things to distinguish it from a hoppy brown ale, porter, or stout and emphasize the IPA-esque aspects of the beer. If we’re going to distinguish Cascadian dark ales (or whatever you choose to call them) from other strong dark ales, the first place I would look is at the body of the beer. 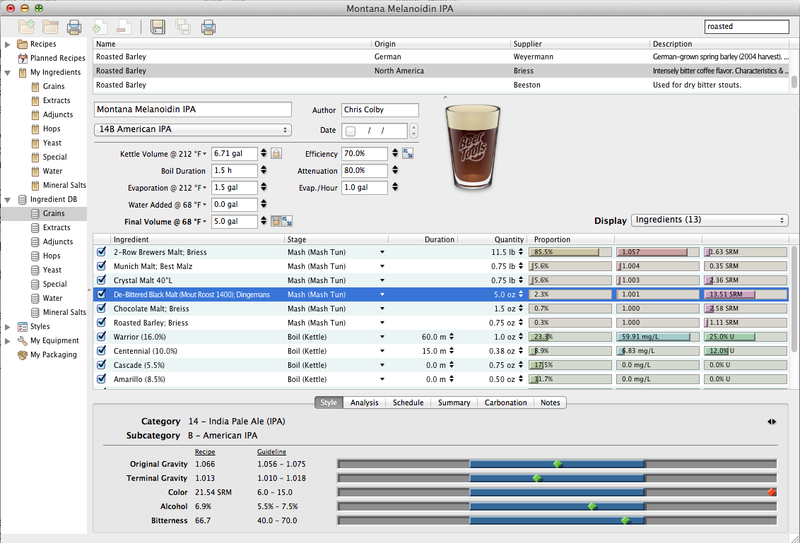 American-style IPAs are meant to be fairly dry, to force the hop character to be the focus of the beer. As such, the caramel or crystal malt component is usually held to 5% or less of the grain bill, with lower colored crystal malts (30 °L or under) being most common. 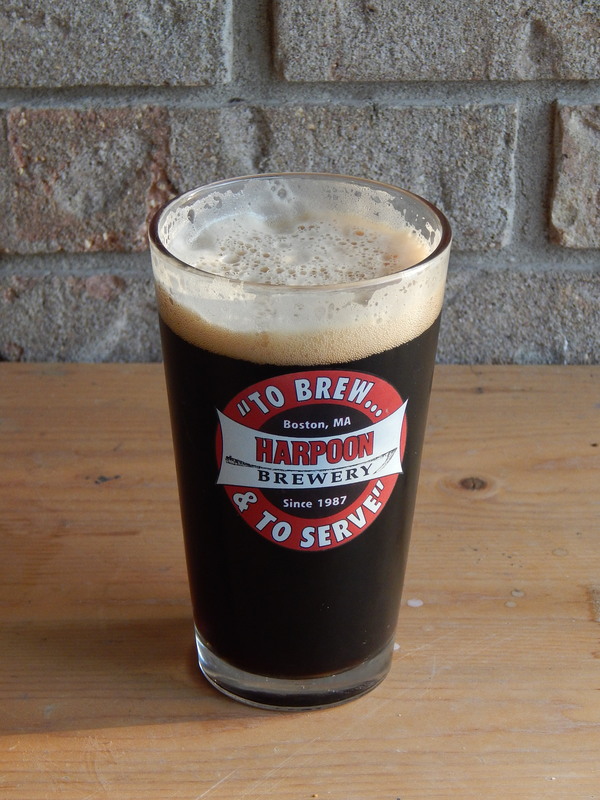 Secondly, the intensity of the roasted malt character shouldn’t rival that of a stout or porter. As with black IPAs, the use of debittered back malt will give you lots of color, but less roasted character because the aroma from black malt is very subdued. One way to assemble a recipe for this kind of beer would be to start with an established IPA recipe, then swap in elements from an established dark ale recipe you enjoy. 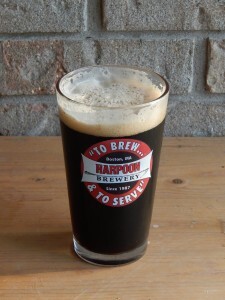 Choose a stout, or better yet a porter that is brewed with a fair amount of black malt. As an example, I’ll use my IPA recipe, Roswell IPA, and blend in aspects of my porter, Colby House Porter. An alternate approach, of course, would be to find a clone recipe of a beer you like and start with it. But for the sake of argument, let’s say you want to build your own recipe from scratch. My Roswell IPA uses Warrior, Centennial, Cascade and Amarillo hops, all grown in the US Pacific Northwest, so let’s leave that aspect of the recipe alone. The grain bill is just base malt (a blend of US 2-row and a bit of Vienna malt) with around 2.5% crystal malt (30 °L). The grain bill for the porter is base malts (English 2-row pale ale malt and a little Munich), 9% crystal malt (40 °L) and the dark grains. (I occasionally use a blend of 40 °L and 60 °L crystal malt.) The dark grains are chocolate malt, black malt and roasted barley, that together comprise 9% of the grain bill. The general rule for IPAs is to keep crystal malts at or below 5% (and Roswell IPA is at 2.5%). In many porters, they comprise about 10% of the grain bill (and my porter is at 9%). So let’s set the percentage at 5%, but go with either crystal malt (40 °L) or a blend of mostly crystal malt (40 °L), with a smaller percentage of crystal malt (60 °L). At 5% of the grain bill, the beer will still be relatively dry; however, with a darker crystal malt, there will be a bit of caramel flavor to support the roasted malt character of the beer. We could perhaps go a little bit higher in terms of crystal malt percentage, but if so, we should keep it below typical porter levels. If you take two established recipes and meld them as above — keeping in mind to keep ingredients that add body down to IPA levels, and keeping the levels of roasted malt aroma and flavor below that of a stout or a porter — you should end up with a tasty Cascadian dark ale, er I mean Montana melanoidin ale, no wait, I mean relatively dark, IPA-like thingy. Whatever you call it, it’ll be good if you brew it well. You made a typo. It’s only 140g not kg. Whoops, yep. Good catch. Fixed.